Classic shows from the ’50s and ’60s – the so-called golden age of musical theater – keep being revived and often given a directorial spin to add a new viewpoint or to fall more in line with contemporary attitudes. Think of the modern opening touch in the recent Broadway revival of Fiddler on the Roof, the more Shavian ending wordlessly attached to My Fair Lady or the new, more politically correct version of Kiss Me, Kate. 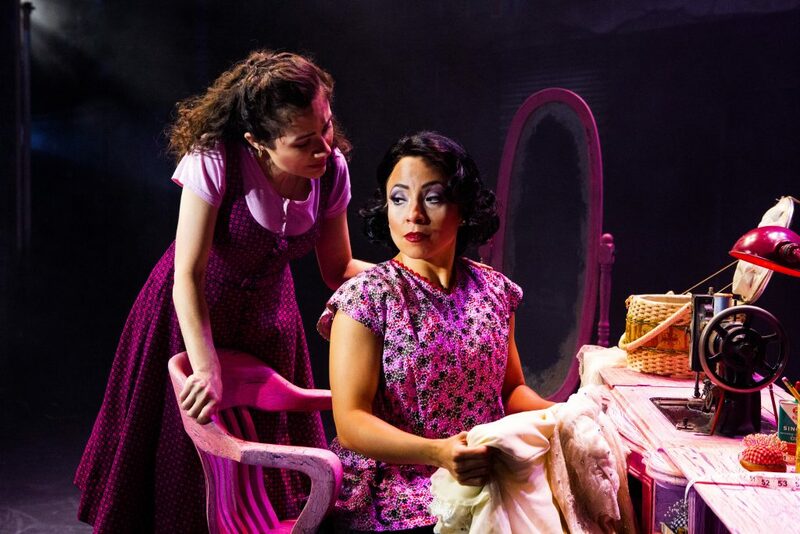 Now comes West Side Story at the Maltz Jupiter Theatre, in which its director Marcos Santana – himself a native of Puerto Rico – attempts to correct a perceived imbalance that favors the Anglo-American Jets over the Sharks, the island-born Latinos. He wants us to see the culture clash on the streets of New York through the eyes of Maria, the new arrival to our shores who falls in love with former Jet Tony, which only escalates the violence between the two factions. So he tacks on a framing device of a “Mature Maria,” who returned to Puerto Rico after West Side Story’s tragic conclusion and – as if she didn’t have enough troubles – is devastated by 2017’s Hurricane Maria. Hey, it could have happened, especially since the “somewhere” of the second act’s “Somewhere Ballet,” choreographed by Al Blackstone, is an idealized Puerto Rico. There are other touches to tip the scales towards the Sharks, like bits of Spanish interpolated into “I Feel Pretty” and “A Boy Like That,” but none of this really affects the overall impact of the show, which remains one of the handful of great musicals of any era. There are some head-scratchers along the way, like the set’s faint wall drawings that become more distinct over time, but focus instead on the emotionally moving experience, thanks largely to the energetic company Santana and Blackstone have amassed. Chief among them are Jim Schubin (Tony) and Evy Ortiz (Maria) – the Romeo and Juliet of this updated rewrite of Shakespeare. The “Tonight” sequence, the equivalent of the Elizabethan lovers’ balcony scene, is particularly exquisite here. Both performers have soaring, expressive singing voices that are more than up to the challenges of the Leonard Bernstein-Stephen Sondheim melodic, jazzy and occasionally operatic score. Do not be surprised if these two star-crossed lovers break your heart as they struggle to find happiness together in a world of ethnic conflict. 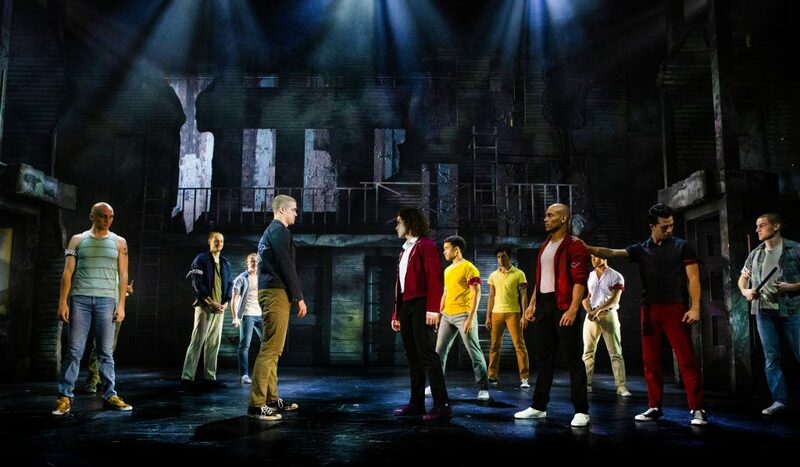 More than most classic musicals, the staging of West Side Story has been dictated by its original director-choreographer Jerome Robbins and, more recently, by his estate. Commendably, the Maltz production breaks with that often contractual tradition which gives the show a freshness, even if some of Robbins’ iconic steps are much missed. The conflict-establishing “Prologue” as well as the “Dance at the Gym’s” clash of styles and the artful violence of “The Rumble” are all similar, yet choreographically distinct from what Robbins devised, while the “Somewhere Ballet” represents the greatest departure for Blackstone. Santana is understandably proud of being able to cast the Sharks gang entirely with Latino performers and there is not a weak dancer in the sizeable ensemble. Often a standout, Anita – girlfriend of gang leader Bernardo and “big sister” to Maria – is played with high sass and skirt-swishing sexuality by Michelle Alves. Adam Koch’s sets emphasize an urban gray palette, particularly on a crumbling tenement backdrop which can move forward and recede, simulating a cinematic zoom. Cory Pattak’s lighting often bathes the stage in a dramatic red and Jen Caprio’s period costumes help delineate the two gangs. Koch and Pattak are returning to the Maltz, having handled similar assignments on Santana and Blackstone’s Newsies, as is music director Andrew David Sotomayor, who gets a lush, symphonic sound from his 12-piece orchestra. 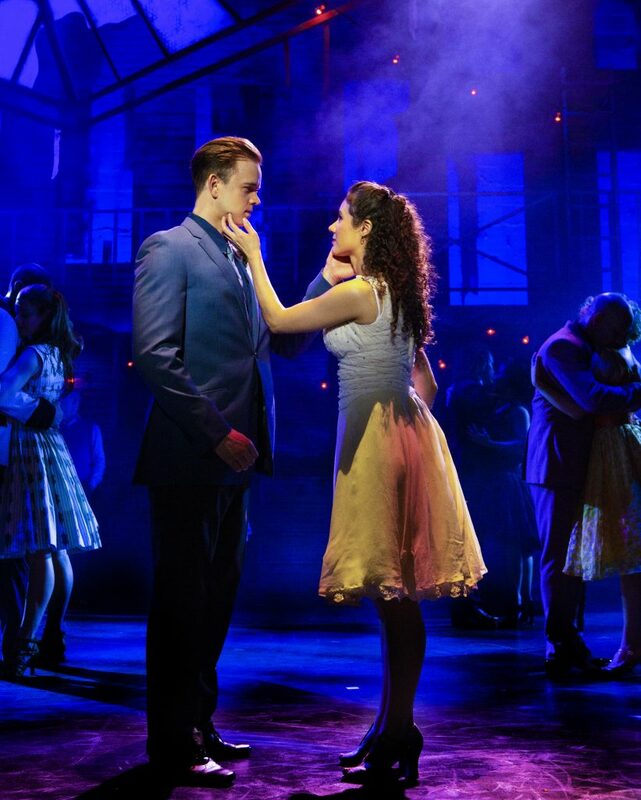 Those who have seen West Side Story before – Is there anyone in the Maltz audience who hasn’t? – may be drawn to this production’s new look and Hispanic viewpoint. Some may prefer a more traditional approach to its storytelling. But either way, the power and emotional impact of the show remains entirely intact. WEST SIDE STORY, Maltz Jupiter Theatre, 1001 E. Indiantown Rd., Jupiter. Through Sunday, April 14. $60-$120. Call 561-575-2223 or visit www.jupitertheatre.org.